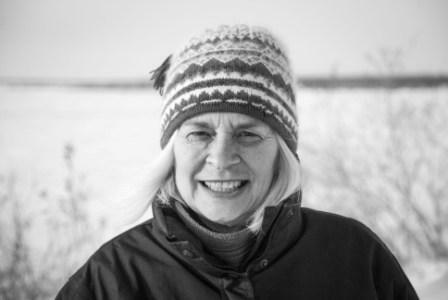 Betty Harnum is well known for her energetic support for Aboriginal cultures and economies through her various roles and projects in government and as a consultant in the NWT. This project will bring her full circle back to resume work that provided her with her introduction to the North in 1975-1976, involving the successful establishment of the now world-famous Fort Liard Craft Shop. Betty has used her extraordinary language and strategic planning abilities over the years to support Aboriginal communities in realizing their visions for maintaining their traditional knowledge and skills. Within six years of arriving in the NWT, Betty had taken on a leadership position as Executive Assistant to the Minister of Aboriginal Rights, Local Government and Constitutional Development. She subsequently served in a number of leadership positions in Aboriginal language programs for the Government of the NWT. She was appointed by the NWT Legislative Assembly as the first NWT Languages Commissioner and served in this position from 1992-1996. By 1999 she was instrumental in establishment and maintenance of the Goyatikǫ language and cultural institute of the Yellowknives Dene First Nation. Following a multitude of major contributions as a consultant, Betty designed and facilitated an innovative terminology workshop on Species At Risk for the SRRB in the spring of 2013. The workshop was a resounding success – in part because Betty had previously worked with a number of the people and was completely comfortable communicating across cultures.